Less bulky, but still cosy, the famously warm Heat Holders thermal socks are now available in a medium thickness ideal for wearing with casual fit footwear. 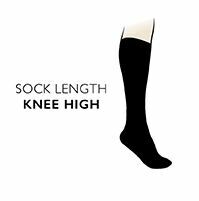 These ladies Heat Holders 1.6 TOG Lite Knee High Socks are longer length (great for riding boot styles) made from specially developed yarn with a looped pile that has been intensively brushed on the inner. The brushing process produces a lining that isn't just soft, but grabs and retains that lovely warm air. And, because Heat Holders’ legs are comfortably non-binding, they are diabetic friendly, making them suitable for those with circulation problems who need relief from cold feet.